If you’re not lucky enough to have a property measured in acres instead of metres, conveniently positioned at the edge of a lush forest, you can still adopt some of the landscaping and planting ideas from this spectacular woodland garden located in southwestern Ontario (Canadian garden zones 5b to 6a). Even its grandest elements, like the rivers of plants that stripe a hillside, the sculpted meadows or the architectural dock can be translated for a smaller garden. Blending formal garden design with woodland charm, here are ideas covering everything needed from pergolas to fountain sprouting pond. Though the pergola that marks the entrance to the property is very large you might very easily drive right past it because the structure’s weathered wood perfectly matches the silvery grey trunks of the living trees flanking it and its open sides with slender supports mimic the neighbouring tree trunks. The driveway winds past groupings of trees and glimpses of lawns and perennial beds to the top of a hill where the home is located. The hillside slopes steeply along one side of the drive, emphasized by vertical beds of perennials running down from the edge of the drive to the lawn below. A bench near the front door to the house is situated to take in the view. Planting a ‘river’ of one type of plant can work in much smaller gardens, too. Regardless of scale, the distinct line that’s created works to lead the eye. Whenever your eyes are moving along a line, there is a feeling of perspective and distance. Tall, narrow pergolas, also in the same silver grey as the surrounding trees, hug the sides of the home, forming semi-covered walkways that lead you from the front door to seating areas at varied heights at the back of the house. Even though the home is surrounded by long swathes of open lawn, this enclosed walkway creates a feeling of intimacy and intrigue as you make your way down to the main seating area. Along the way, your eye is caught by two birdhouses and a rock–a simple garden decor grouping that perfectly complements the woodland setting, perched on (what else?) a tree stump. The main seating area unexpectedly faces the house but what a view! In the photo, above left, you can just make out the top of a waterfall which pours down a full storey through terraced beds of plants to an ornamental pond (shown in the photo above right). The pond, complete with its own waterfall and heron sculpture, flanks the far side of the seating area. Once you tear your eyes away from the water features next to the house, another feature grabs your attention. Just steps beyond the seating area near the house, a small garden surrounded by rustic fencing beckons. Inside this garden within a garden is another water feature surrounded by small beds of ornamental plants and some edibles. Though this enclosed garden is quite rustic, the pond, the gate, and stone paths encircling the beds perfectly marry formal garden design with the charm of a woodland garden. 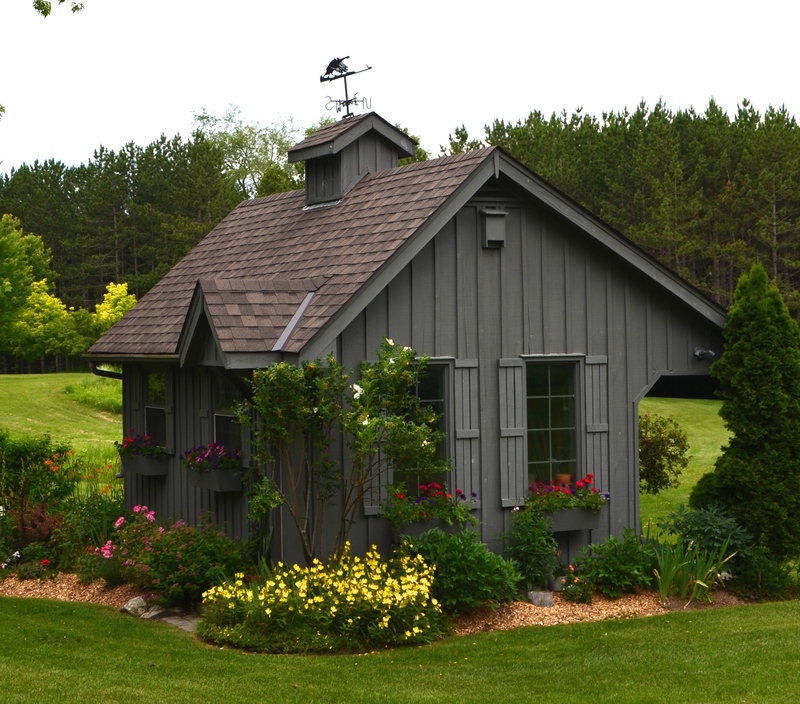 Even the adorable garden shed introduces a touch of formality without looking out of place in this magical forest setting. Just beyond the enclosed garden, a bright, sun-drenched view opens up of forest-fringed meadows. Mowed areas add a subtle form of formality, reigning in the wildness, while also working as a seamless segue from this area to the adjacent lawns. Some parts of the property have been left wooded but the undergrowth has been cleared away to reveal tantalizing glimpses of the meadows beyond as well as adding light and drawing attention to the rhythmic tree trunks. A meandering lane leads you past forested areas along the edge of a large pond. Through the trees and perennial plantings, you can make out a sunny deck and dock. Again, there’s just enough formality in the design of the seating area and the dock to complement the rest of the garden yet still maintain a relaxed and inviting atmosphere. And, once again, the stone work in the patio area and the wood used in the pergola, deck and dock all have the same silvery grey tree trunk colouring, creating a calming unity. Want more woodland garden ideas? You’ll find plenty of ideas for working with trees and big stones in A Woodland Garden Rocks On The Coast Of Maine.